You just might want to plan a tea and invite a few friends over for a relaxed afternoon. 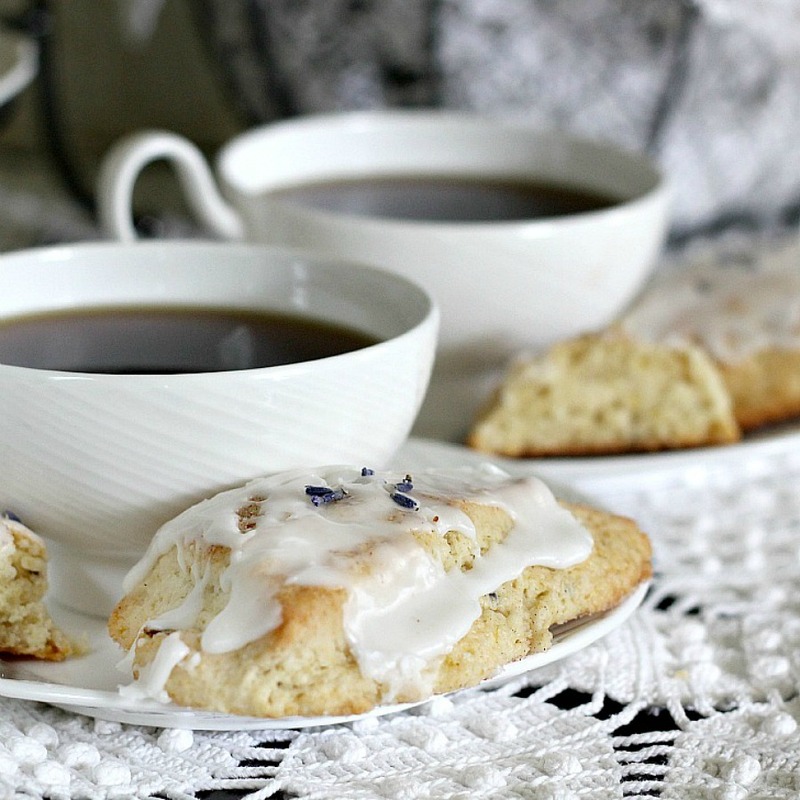 These glazed Sweet Lavender Scones are delicious with coffee or tea. Lavender buds impart a mild floral hint that is unique but not overpowering. They look lovely and taste amazing. 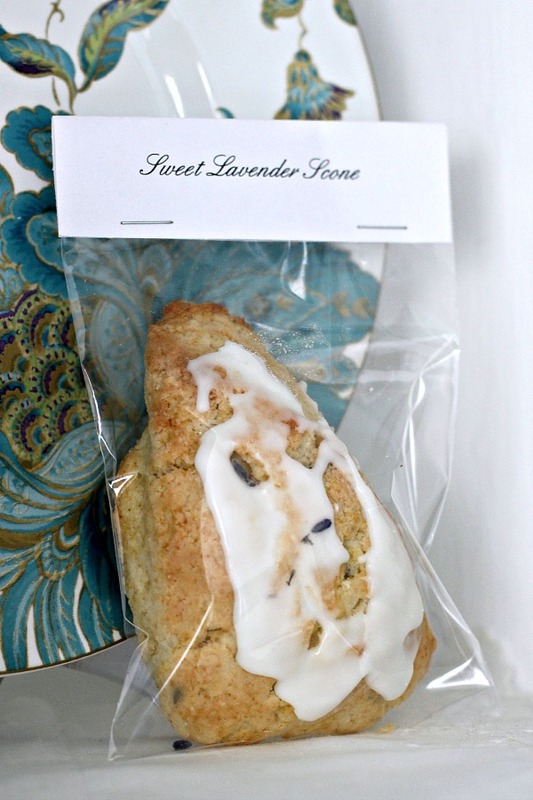 These fragrant, sweet lavender scones were made using lavender from my herb garden. If you don’t grow your own culinary lavender you can purchase buds from Amazon. I have a small, 4-foot by 8-foot raised bed where I grow herbs and a few flowers each year. It is close to the side door, in full sun, making it easy to snip what I need each day for cooking and baking. 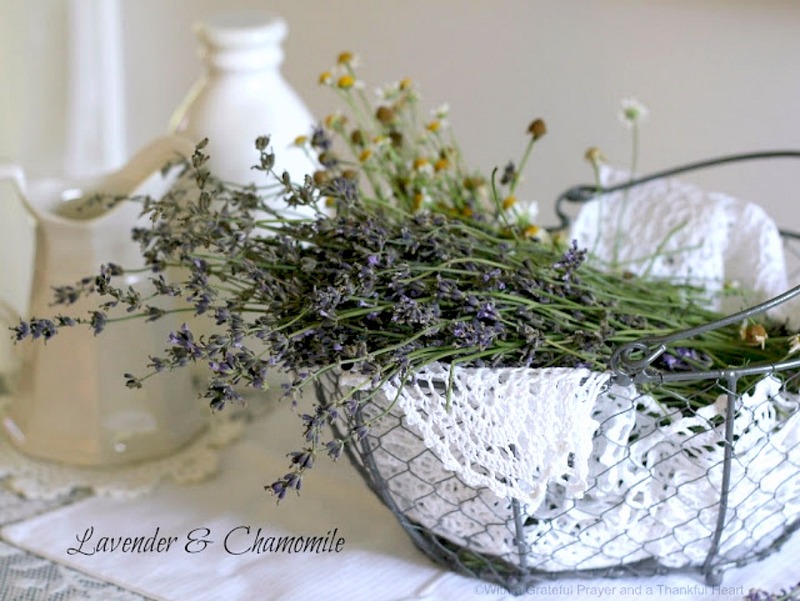 I recently gathered a basket of lavender and chamomile. The scones look so pretty I thought it would be fun to served them in the parlor. 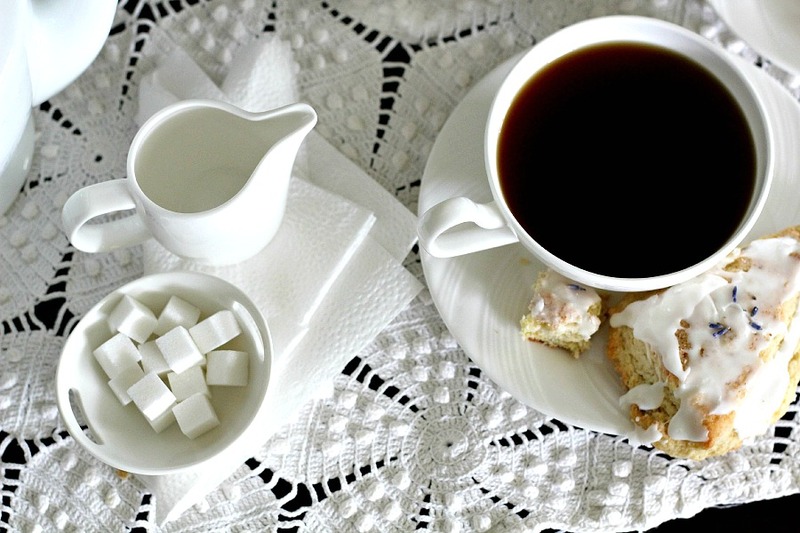 I set up a small tablescape on a vintage crocheted cloth and brewed a pot of coffee. 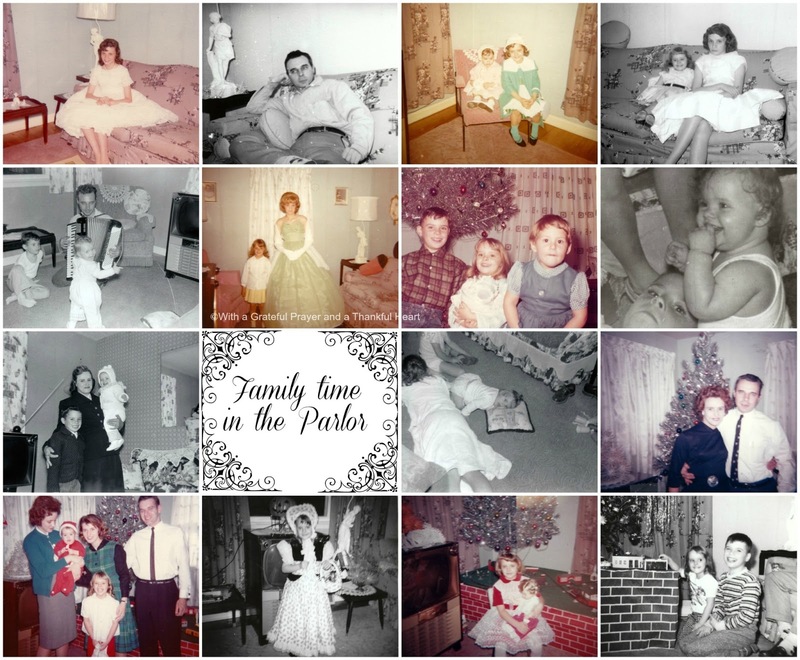 Growing up my parents called the front room of our home a parlor. Now days, we call it a living room. We didn’t have a family room when I was a kid so unless you were in the kitchen, your bedroom, the bathroom or the cellar, (yes, that’s what we called it) all activity happened in the parlor. Our parlor wasn’t filled with ornate furnishings or stuffy decor. A sofa, chair, end tables, lamps, some knick-knacks and the television with a set of rabbit ears on top. The parlor was where the Christmas tree on the platform with trains, little plastic houses and handmade mountains and trestles were displayed each December. while watching TV shows like The Twilight Zone, The Fugitive, Route 66, Gomer Pyle USMC, The Outer Limits, The Honeymooners, The Red Skelton Show, Perry Mason, and The Lawrence Welk Show. I was, indeed, still awake when they asked. until wee hours of the morning. It was from this room, when during one of those late-night movies that my mom screamed for my brother because she heard a frog leap down the stairs from his bedroom. It was a family room but I kind of like the word Parlor. We never heard of scones growing up. Too bad because they’re really good. 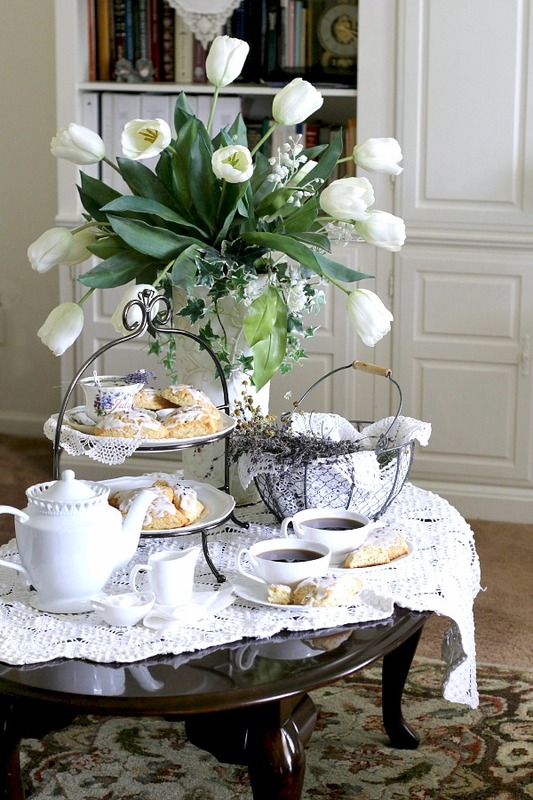 I think you will enjoy these lovely scones even at the kitchen table. Arrange oven racks in upper and lower thirds of oven; preheat to 425°F. Line 2 baking sheets with parchment paper or silicone mats. Whisk 3 cups flour and next 5 ingredients in a large bowl until evenly combined. With a pastry blender, cut in the butter until mixture resembles coarse meal. Whisk together, 1 cup buttermilk, zest, and vanilla in a small bowl. Add the wet ingredients to dry ingredients. Gently stir just until dough forms; avoid over mixing. Transfer to a lightly floured surface; knead until dough forms, about 5 turns. Pat into a 10×6″ rectangle. Halve dough lengthwise. Cut each half crosswise into 4 squares. Cut each square diagonally in half into 2 triangles. Bake until scones are golden and a tester inserted into the center comes out clean, 13-15 minutes. Transfer to wire racks; let cool. Stir ingredients together in a small bowl, using just enough cream for desired consistency. Spread on mostly cooled scones and top with a few lavender buds. I like to drizzle on the glaze while the scones are just a little warm so it drips down the sides. Too warm and the glaze just melts. 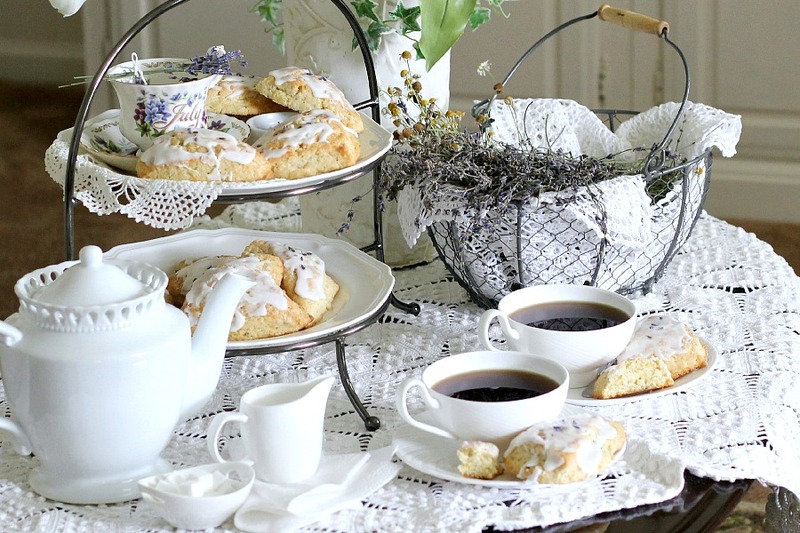 You might like to serve the scones with lemon curd. 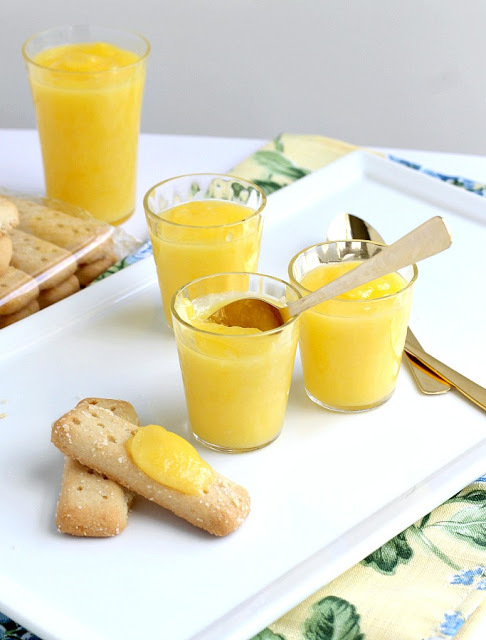 Click through for my easy recipe to make foolproof lemon curd in the microwave. Packaged individually to set at a co-workers desk or a batch gifted on a plate, Sweet Lemon Scones are sure to brighten someones day. I just made these scones today and they were AMAZING! I doubled the amount of lavender and followed the rest of the recipe. It tasted amazing! Haven't had such perfectly soft and moist scones before! Thanks for sharing! Spring always gets away from me. Spring, summer, fall, winter. I always seem to be running a season behind. 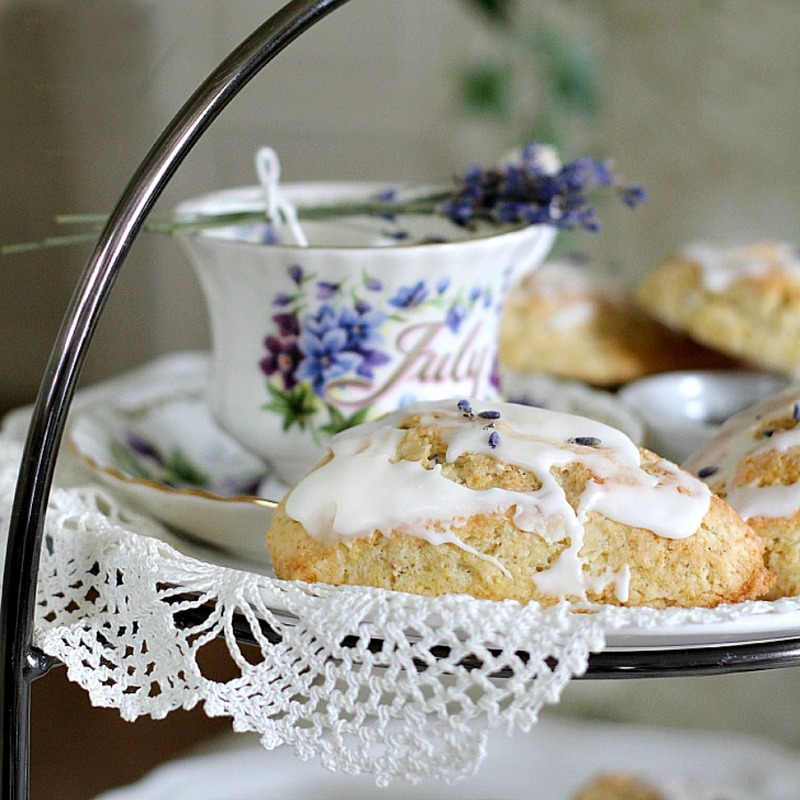 I missed getting lavender for the garden this year and am now kicking myself because I so want to make these scones. I think I clicked over from Rooted in Thyme. So beautiful! I love all the white with touches of blue. 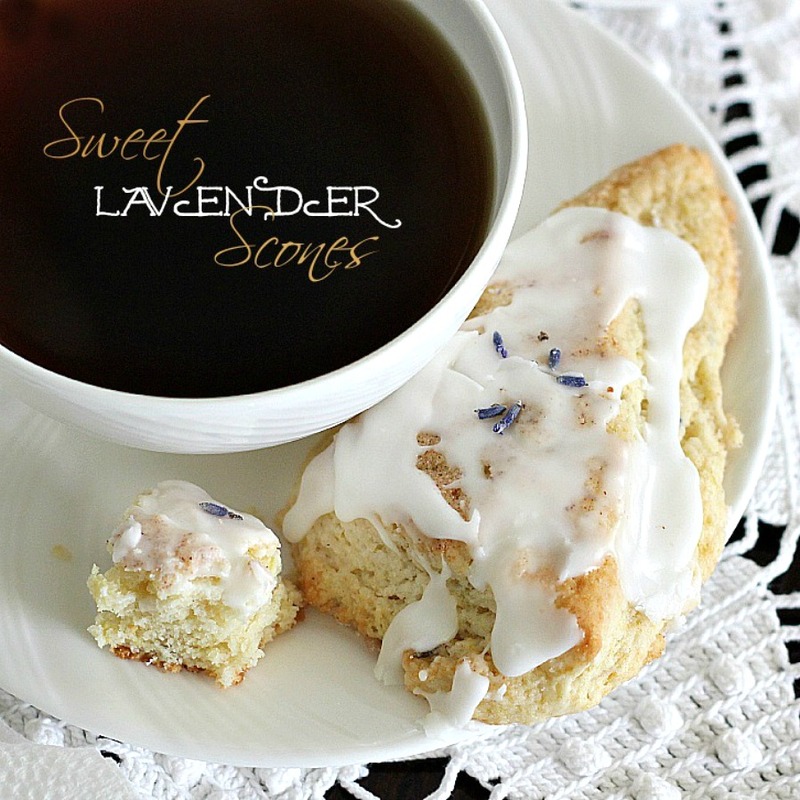 The scones look delicious with lavender. I just made some gluten free cranberry scones for a tea party. Lovely post! We never called ours a parlor growing up, and we didn't have a den, but it was a big living room, 20 x 20, lots of chairs, and still room to dance while watching American Bandstand! The scones look so good! Thanks for linking to Let's Dish, enjoy the weekend. This makes my mouth's watering. Love all the pictures..just beautiful. Thanks for stopping by the cottage. I am a quiet visitor to your door usually:-) Love your recipes, how I wish I didn't have dietary restrictions–they always look so yummy! You brought back some memories for me with the different TV shows that you listed. SCONES were always in books that I read…because I think that I must have read a lot of books by English authors over the years. I loved everything about this post…soo sweet and lovely. I like it being thought of as the parlor too. The scones look DELICIOUS! Hope you enjoyed your day! Thanks for sharing your delicious scones, they look so yummy! Oh, I love scones and we did not have them as children, either. I loved your photographs – some of them could have taken from our photo albums (with different faces, of course!). Such a sweet post! We never had scones either, but I do like them and yours look delicious. 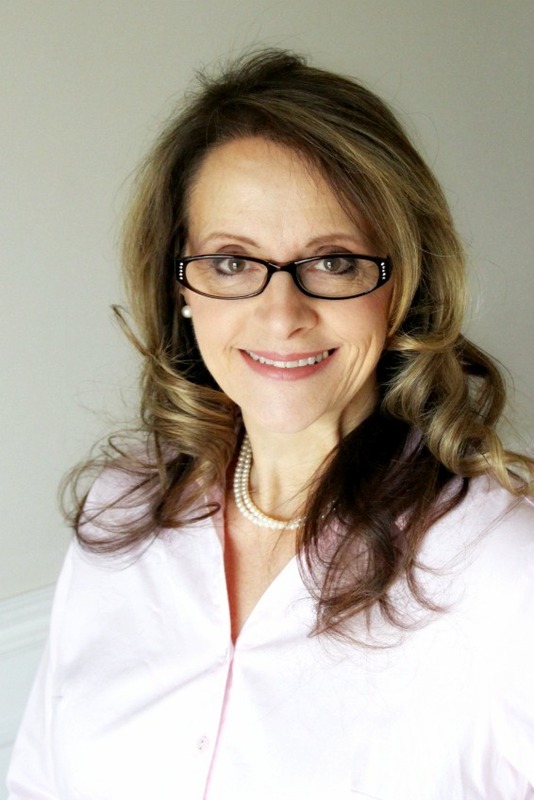 Lorraine, you take the prettiest photos and arrange everything so perfectly. I loved the memories of TV watching in the parlor with your parents. Your scones sound and look delicious. Both my grandparents had a parlor, and on my mothers side 7 children and on my fathers 12! Neither had big houses but despite a need for space, in both households the parlor was only ever used when the priest was visiting!! As for the scones – I loved the fact that you used lavender. I love this post, those scones look amazing and I like the word parlor but we wouldn't use it in the UK these days. We would use the word cellar instead of basement. I love your family photos too, I used to fall asleep on the lounge floor and my Dad would carry me up to bed. We just had lounge, dining room and kitchen but over here people would sometimes call the lounge a sitting room or front room as it is usually at the front of the house. You brought back some of my own childhood memories while I was reading this. You scones look so inviting…too bad I don't live next door…enjoy! That's really really sweet!. Thanks for sharing such wonderful memories with yummy looking scones as well :).